What Are the Uses & Benefits of Tyrosine? How Do I Take Tyrosine? Are There Any Side Effects and Precautions? How Do I Pick a Good Tyrosine Supplement? In order to help you find a good l-tyrosine product, we’ve narrowed down the best tyrosine supplements on the market right now. Now Foods L-Tyrosine is a pharmaceutical grade tyrosine pill made in a Good Manufacturing Practices (GMP) certified facility. It offers 120 servings of 500mg tyrosine per pill, without any GMO ingredients. Now Foods is a natural health brand that offers a wide variety of natural health supplements and products. The company has been around for about 50 years, and is known for using primarily organic, non-GMO ingredients. This is one of the most affordable, high quality tyrosine supplements on the market. You get 500mg servings of top of the line pharmaceutical grade tyrosine for a low price, which means you are getting a high value in Now Foods L-Tyrosine. BulkSupplements Pure L-Tyrosine Powder is a clean and pure tyrosine powder free from fillers and other unnecessary ingredients. It is offered in a bulk quantity for a great price — if taken at 400mg doses, there are 1,250 servings per container. 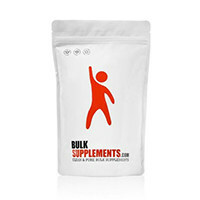 BulkSupplements is a supplement ingredient supplier offering pure, bulk supplements to both manufacturers and consumers. The company offers over 400 different supplement products available from grams to metric tons. This is one of the best tyrosine supplements available for those interested in buying in bulk. This pure tyrosine powder is very affordable and offers a huge quantity. If taken daily at the suggested dose, it is a three-and-a-half-year supply. 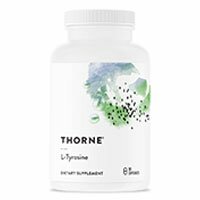 Thorne Research — L-Tyrosine is a pill offering 500mg tyrosine in a small capsule that’s less than an inch long. It is made without any gluten, dairy, nut-based ingredients, high-fructose corn syrup or eggs. Thorne Research is the most dispensed nutritional supplement brand by 30 and 40-year olds. The company uses pure ingredients and scientific research to formulate its products. Made by a reliable brand and free from allergens, toxic and unnecessary additives, this is one of the top tyrosine supplements on the market right now. The 90 pills provide a good tyrosine dosage of 500mg. Nova Nutritions L-Tyrosine pills are made in GMP certified facilities in the United States free from many allergens, such as gluten and egg. This top tyrosine supplement provides 180 servings of 500mg capsules. Nova Nutrition is a nutritional supplement brand based in New Jersey. The company is committed to providing science-backed supplements while satisfying its customers, claiming they have superior customer service. This tyrosine pill is made in the U.S.A. in a GMP certified facility free from gluten, artificial colors, flavors and sweeteners. Though it is good quality, its pricier than many alternatives. 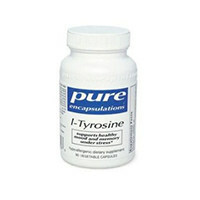 Pure Encapsulations – L-Tyrosine is a hypoallergenic top-quality tyrosine supplement that is offered in a vegetarian capsule. It is free from gluten, GMO ingredients and made by a brand that’s trusted in the medical community. Pure Encapsulations is a nutritional supplement company that strives to develop supplement formulas with predictable results. The company specializes in hypoallergenic products. Though this tyrosine pill is one of the pricier options on the market, it does offer high quality hypoallergenic tyrosine. These pills offer 500mg tyrosine made in a vegetarian capsule. 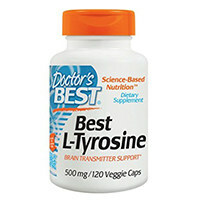 Doctor’s Best L-Tyrosine Supplement is a third-party tested, clinically researched top tyrosine supplement made with only tyrosine and a vegetarian capsule. It’s one of the best priced tyrosine supplements available. Doctor’s Best Vitamins is a physician-founded supplement brand offering over 200 products. It is almost 30 years old and continues to offer supplements made with primarily well-researched, branded ingredients. This affordable tyrosine supplement is pure — the only other ingredient in it is the vegetarian capsule. Made in a GMP certified facility, the pill offers 500mg tyrosine. 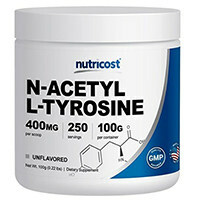 Nutricost Pure N-Acetyl L-Tyrosine is a powdered tyrosine supplement that comes with a scoop measurement for a 400mg serving. Nutricost is a supplement brand focused on offering quality health products at affordable prices. Its products are backed by a 100% money back guarantee. Overall, this tyrosine supplement makes the list because it offers quality and affordable free form tyrosine. It is made in the U.S.A. free from gluten and GMOs. 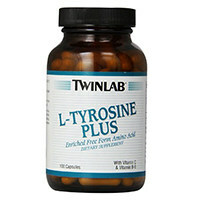 Twinlab L-Tyrosine Plus is a tyrosine pill fortified with vitamin C and vitamin B6. It is taken in servings of two capsules per day which provides 500mg tyrosine. Founded in 1968, Twinlab is a family owned and operated nutritional supplement brand that started with a liquid protein supplement. Today, they offer a large variety of vitamins, minerals and nutritional products. This is a good tyrosine supplement made in the U.S.A without binders, coatings or added colors. It’s free from common allergens, too. However, it’s pricier than many alternatives. 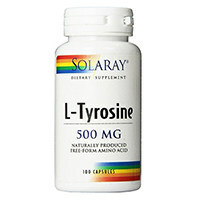 Solaray L-Tyrosine Free Form Supplement is a naturally produced free form tyrosine pill that’s available at an affordable price. Solaray is a nutraceutical producer that was founded in Utah in 1973. The company offers almost 1,000 different health products, available in 60 countries worldwide. This basic tyrosine is an affordable option that’s good for many people interested in trying this amino acid. However, it has few customer reviews to go off of. 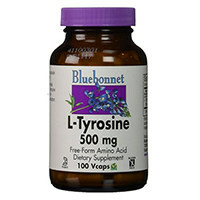 Bluebonnet L-Tyrosine is a non-GMO, kosher and gluten-free tyrosine pill. It’s made in a vegetarian capsule which provides 500mg tyrosine. Bluebonnet Nutrition is a natural health supplement brand that’s been in the industry for over 26 years. Most of its products are organic, non-GMO, kosher and allergen-free. Made free from gluten or GMO’s, this kosher 500mg tyrosine pill is a good option for many. The price is middle-of-the-road. Overall, tyrosine supplements may benefit a number of needs and conditions, but more research is necessary. Cognition: A number of studies have shown tyrosine to have a preserving effect on cognitive functions during times of physical stress. A study conducted on military cadets found tyrosine beneficial for improving mood and cognitive function during combat training. (6) Another study with military personnel showed that tyrosine supplements may reduce the effects of environmental stressors, such as cold and reduced oxygen, on mood and cognitive function. (environment) Finally, a study showed that tyrosine supplements may improve cognition for those under conditions of sleep deprivation. (7) All of these studies show promising tyrosine benefits, but they are also all short-term studied conducted on only young adults for a short period of time. More research is necessary. High doses of tyrosine may cause digestive issues, which can be mitigated by splitting the dosage in half-hour increments. Some other side effects may include nausea, headache, fatigue and heartburn. Good tyrosine supplements are made with L-tyrosine rather than N-acetyl L-tyrosine (NALT). 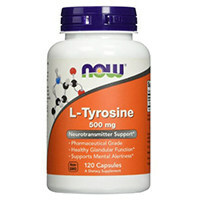 L-tyrosine is also known as free-form tyrosine and is better absorbed than NALT. 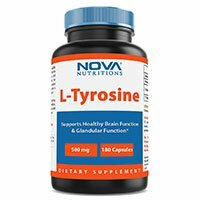 (11) Every product on our top ten tyrosine supplement list uses L-tyrosine.